The performance of your race car’s ignition relies on the charging system. 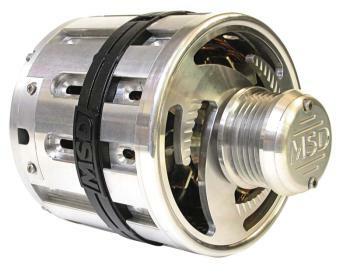 Since these systems go hand-in-hand, it was only time before MSD designed and offered a high output alternator. MSDs new line of Advanced Power System™ Alternators will be available just in time for the 2004 racing and cruising season! Don’t let the billet housing fool you as there’s much more beneath this great looking housing. MSD engineers have spent thousands of hours testing different internal components, materials and windings. A special rectifier with 50 amp diodes improves control and reliability while a new surface mount regulator isolates and protects from high voltage spikes. Even the bearings were hand picked to withstand heavy axial loads and high rpm. Not only does the precision machined housing provide cool looks and great strength, but it also delivers a new universal mounting design called Slide-Loc. This technology allows one unit to be mounted to a variety of engines by selecting a bracket kit. (For speedshops, this feature means that you only need to stock one alternator!) The bracket installation kits are available separately for a growing number of different applications. Two models will be available in three outputs; a 105 amp, 130 amp and 160 amp version in either a direct plug-in installation or a one wire model.